This system includes CNC machined steering knuckles to return your vehicle's steering to OE geometry. 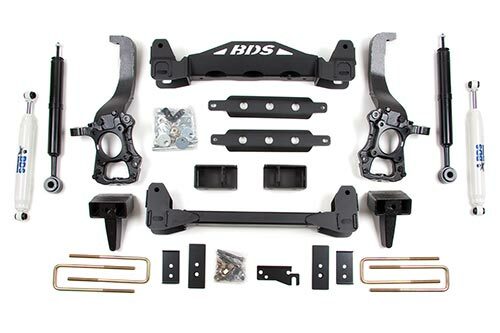 One piece front & rear High Clearance crossmembers increase rigidity for long term performance as well as dramatically increase ground clearance. A 1/4" thick steel differential skid plate and is included to ensure off road protection. New custom valved off road struts are supplied that are designed to handle the increased load of an oversized tire while still maintaining the OE ride quality. The rear is lifted with a new block. The rear also includes a new offset spring plate to center the rear axle and give your 37's plenty of room. Kit is upgradeable to Fox 2.0 rear shocks. 17" wheels will not work with this system, 18" or larger must be used. If using 18x9 wheels with 5.5" backspace, dry fit the wheels to check for proper tie rod clearance. Some wheel manufacturing variances may affect this clearance. Stock 20's with up to 305/60R20 tires can be re-installed, but stock 17's & 18's will not fit. Certain models with a 2 piece rear driveshaft may require carrier bearing drop shim kit 123402.